Sonatina IV-VI for two viols and b.c. Sonata VII-VIII for viol and b.c. Sonata IX and Aria X (chorale) for viol and b.c. 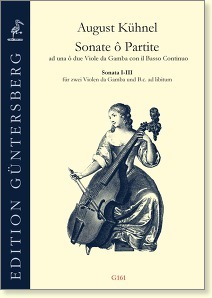 The Sonate ô Partite number among the most important German compositions for viola da gamba at the end of the 17th century. 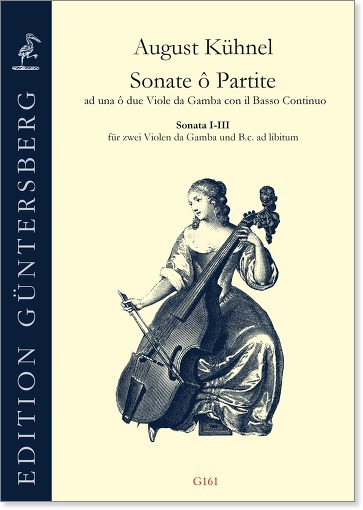 The work contains fourteen consecutively numbered sonatas or partitas of which the first six are for two viols, and the rest for one viol – all with continuo. The best-known piece is undoubtedly no. 10 (G164): a solo sonata, designated “Aria,” with nine variations on the chorale “Herr Jesu Christ, du höchstes Gut.” The first three and the last four pieces are composed in such a way that they can also be played without continuo. The level of difficulty varies. G161, page 9, bar 81, VdG 2 and Basso: third note d instead of d sharp. G161B, page 3, bar 81: third note d instead of d sharp. G161C, Seite 1, Takt 81: third note d instead of d sharp.